Education experts say the math curriculum across Canada needs urgent changes in order to boost slumping test scores, and are closely watching developments in Ontario. Last week, the Ford government promised a back-to-basics approach while introducing mandatory math tests for new teachers. With the percentage of students meeting provincial math standards dropping to a record low this year, Ontario’s Progressive Conservative government said it will scrap the current curriculum that focuses on creativity and discovery-based math in favour of traditional memorization techniques and formulas. “This is unacceptable,” said Education Minister Lisa Thompson in a statement after test results came back this summer from the Education Quality and Accountability Office showing only 49 percent of Grade 6 students met the province’s standards in math in 2017-2018—a five percent drop from 2014. 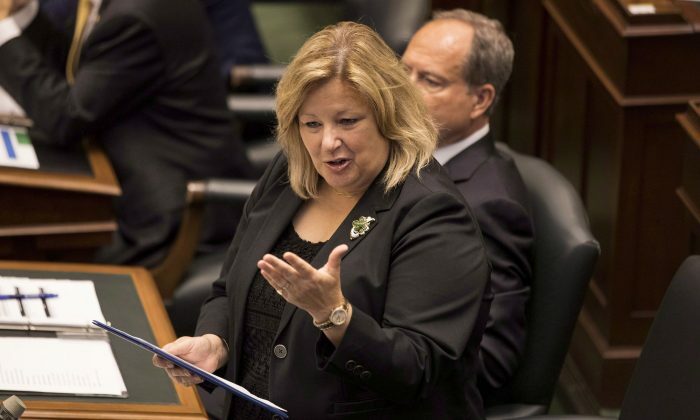 On Oct. 25, Thompson announced the Safe and Supportive Classrooms Act, stipulating that teachers looking to work in Ontario will have to successfully complete a mathematics proficiency test as a requirement for registration. Details about the required math test have been scant, but Thompson told reporters that more information would be available as the government holds consultations with those involved in the education sector. Kim Langen, co-founder and CEO of the Spirit of Math, Canada’s largest after-school math program, says an assessment on teachers’ knowledge in math definitely has merit. “I think it really is needed because a lot of teachers are struggling with mathematics. A lot of elementary teachers in particular are struggling with mathematics,” she says. A mandatory test is just one step in tackling declining math scores, Langen says. Addressing a “weak curriculum” due to over-emphasis on discovery-based math in each province is also vital if student’s math skills are to be improved. “Really, the mathematics curriculum throughout Canada is extremely shallow. It focuses so much on activities, they have missed the adaptiveness of skillsets,” she says. It was reported last week that in Alberta, slightly more than a third of Grade 9 students in the province failed a standardized provincial math test last year—and the passing grade for the test was set at 42 percent opposed to the benchmark of 50 percent. During the provincial election, Doug Ford promised to get rid of the discovery approach to teaching math, saying it’s “experimental” and doesn’t work. Some experts say that in order for discovery math to be successful, the basic, foundational concepts in traditional math have to be taught as well, and that has been largely overlooked in classrooms. Combining the two is what is important, Langen said, adding that she has seen intense rote memorization learning while working with students in India, China, and now Pakistan, where she is currently teaching. But she says even if the students excel at remembering math formulas, they may not develop critical thinking skills to understand why or how they got their answers. With the advocacy of discovery math in Canada, she adds, students have lost the rigour and discipline that comes with mathematics, which translates into a depleted development of skills. Anna Stokke, a professor in the department of math and statistics at the University of Winnipeg, says putting less emphasis on the discovery curriculum and more on the traditional approach is necessary to bolster students’ math abilities. “The big problem with this sort of thing is in order to be able to solve complex problems in math you have to have a number of certain things in your long-term memory,” she says. Stokke wrote a 2015 C.D. Howe Institute report detailing the failures of discovery math and the decline in math scores over the last decade in Canada. She recommended provincial governments switch out discovery math textbooks for more rigorous and structured ones. “The textbook that a lot parents have complained about for quite some time is Math Makes Sense. It’s a commonly used textbook across Canada and it’s a terrible textbook,” she says. Instead, Stokke has recommended the textbook Jump Math, and although it is being used in some schools, some consultants have criticized it for its back-to-basics approach, she added. Stokke said she agrees with the Ontario government’s move to test new math teachers.